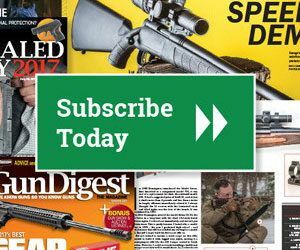 While I am not unaware that the Gun Digest Store often has great promotions running, a few of the offers in the new, 70th Anniversary Sale surprised even me. Here’s my list of deals that are definitely worth checking out. First up is Gun Digest’s Massad Ayoob Ultimate CCW Collection. This package includes five (!) books on handguns and concealed carry, written by Massad Ayoob; a special concealed carry issue of GD magazine; a DVD and access to additional online video. Here’s the kicker – we were selling this collection – with a retail value of $210.38 – for $89.99. Under this 70th Anniversary Sale, it’s been marked down 75% to $52.60! The next notable deal is the Gun Digest Book of the Tactical Rifle. In it, author Patrick Sweeney goes beyond ARs and puts some of today’s other tactical rifles through their paces – from AKs to ARs, AUGs and SCARS, he reviews 25 of the best tactical rifles on the market today. With a cover price of $26.99, this one’s been marked down 82% to $4.99! Last, but certainly not least, is Gun Digest Book of the Revolver. This is a personal favorite of mine. Bottom line, Grant Cunningham knows revolvers, and his passion for them shines through in this informative and entertaining book. Cover price on this one is $22.99, but it’s been marked down 48% and is selling now for $12.00! There’s a lot more in this sale worth checking out, but I’ll stop here. If you’ve read any of the books in the sale and have recommendations, please let us know in the comments below. We definitely appreciate feedback from readers.